These three pieces for advanced players are great fun to play – perhaps in the break of an orchestra rehearsal, or on a music course, or even in a sectional rehearsal when the work to be rehearsed has been perfected? 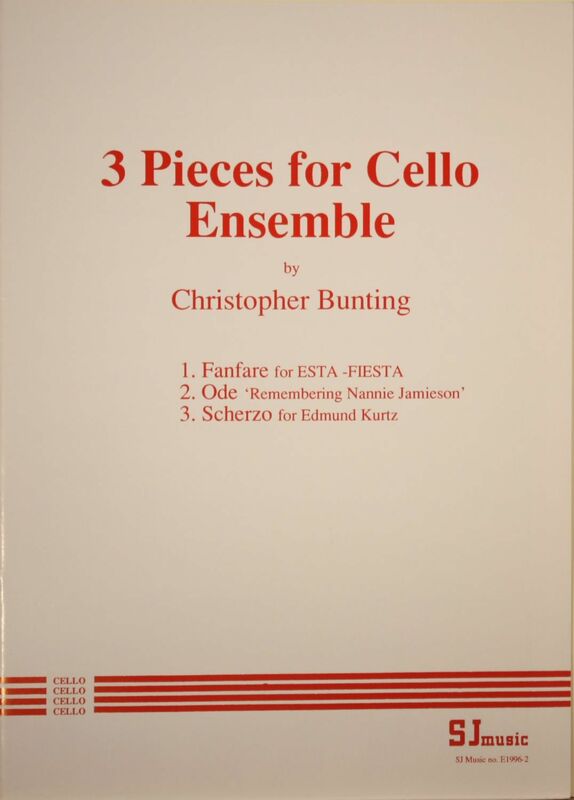 The composer, Christopher Bunting (1924-2005), was a well known cellist and teacher who gave concerts, broadcasts and masterclasses throughout Europe, Australasia and the United States. The Daily Telegraph described him as ‘a master’. Die Welt remarked on his ‘highly developed musical comprehension, prodigious technique and outstanding artistry’, and the Swedish press called him ‘one of the greatest instrumentalists of today’. He thought deeply about the psychological and physical influences that lie behind technique. He is, perhaps, best known for his two volume work (published and sold as separate volumes by SJ Music), Essay on the Craft of ’Cello-Playing (B2000-4 and B2000-5). These volumes give his insights in a commentary interspersed with exercises designed to produce rapid development of instrumental skill.